Between the opening of the revolutionary Avec in 2003 and the refreshing arrival of Jose Garces's Mercat a la Planxa in late 2008, could there have been a more enervated, bush-whipped restaurant style around town than sorta-Spanish tapas and their mutant offspring? These were characterized by unhappy arranged marriages of incompatible cuisines or half-cocked conflations of the traditional and the Adria-esque. The inauthentic imitation of casual, progressive Iberian bar snacking ruled night and day, as tiny nibbles were forced into family-style eating arrangements. At first glance it seems this University Village tapas clearinghouse is just more of the same: small Spanish plates and a few bigger ones, with some nebulous application of New World Latin influences, served up in an environment recognizable to any freshman art-history student, prints of iconic Spanish painters on the walls. Take all of that together with one of the more eyeball-scrambling menu designs in recent memory, and you'd be forgiven for passing on what initially appears to be a collection of insufferable cliches. But it turns out chefs Gustavo Castañeda (Zocalo) and Enrique Cortez (Olé Lounge) are delivering something more. The chefs have a way with those crustaceans—as in an olive-y ceviche, and those bathing in a crock of garlicky olive oil and chile. And they do well with other sea creatures too, such as a plate of three seared scallops encircling a pile of cured sausage scraps and surrounded by messy splatters of saffron cream sauce, or supertender grilled octopus chunks tossed with potatoes and a wonderful, gritty almond pesto. Tweaks like those are less troubling. And so is the nontraditional but light and flaky puff pastry encasing raisiny ground beef in an empanada de picadillo. But generally, it seems that when the chefs aren't jerking around with western hemispheric flourishes, the simple, straightforwardly classic Spanish plates win the day—for example, the pair of meatballs in tomato sauce, the buttery bowl of sherried mushrooms and snails, and the sausage-stuffed bacon-wrapped dates (the dish that built Avec). Which brings me to that most iconic of Spanish dishes. I was happily shocked to find that the house paella is an ideal amalgamation of pork, chicken, chorizo, mussels, calamari, and shrimp. But most importantly, it has a perfect ratio of crispy socorrat and distinctly al dente, fat-saturated, stout medium-grain rice. 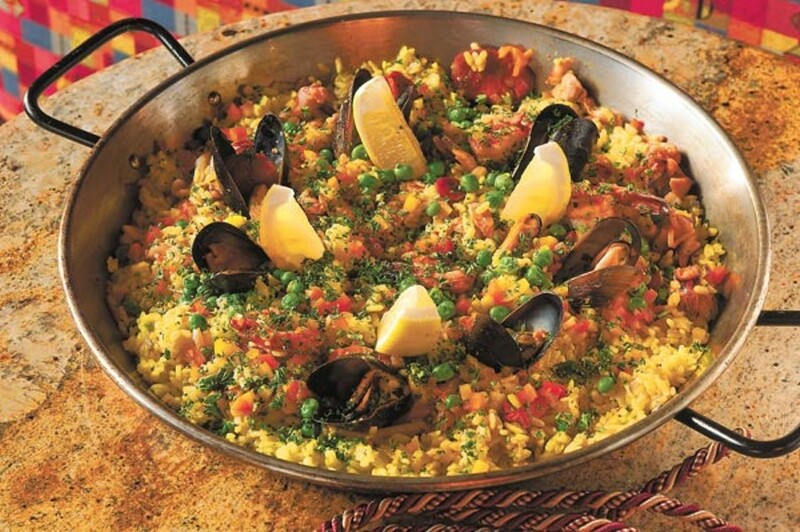 I can't think of many paellas around town that can touch it. One innovation I can definitely get behind is the chile-and-tequila-spiked white Sangria Brava—only slightly spicy, it goes down easy. And in the midst of a list featuring mostly Spanish and South American wines, don't lose sight of two sidras—Spanish hard ciders—listed among the bubblies, particularly the dry, tart Isategui from the Basque region. One weekend evening last month, as a flamenco guitarist entertained the dining room, it took my gang a few minutes to recognize that he was playing a particularly florid version of Radiohead's "Paranoid Android." A nice surprise—the first of many, the chief one being that outside of Mercat and Avec, La Taberna is the most solid, semitraditional tapas joint in town.